"Missouri to California in 10 days"
through some of here most crucial months. Dozens of applicants vied for jobs, eager to accept the death defying rigors they would soon experience. 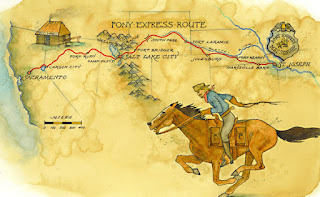 Mark Twain, who saw the Pony Express in action first hand, described the riders as: "... usually a little bit of a man". Though small in stature, their untarnished record proved them to possess the hearts of lions. History would record that they were among the most durable horsemen to ever straddle a saddle.